Okay, you guys. I need to confess something. a) super kewl b) awesome or c) fetch. And before I go on, can we just stop to admire my new orange Mario Batali Cast Iron Lasagna/Roaster? Drooool. Thanks, dad! The confession: I have never been a big fan of lasagna. I know, I know. I’m a disgrace to the food world. Very Important Disclosure Statement: I do like my mom’s and mother-in-law’s lasagna. Let’s just get that straight before this goes viral and the phone starts ringing. I don’t like that the noodles feel extra mushy. When you boil them and then put them in the oven, they seem overcooked. I’m not fond of the ricotta-ish texture. 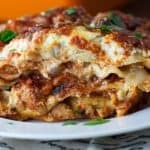 Most lasagnas have too much of it and I don’t think it adds much flavor. That’s where this No Boil Lasagna comes in, running up the stairs with its arms in the air to the Rocky theme. Ta da! By not boiling the noodles, they’re perfectly cooked by the time they come out of the oven. Not mushy. Not freaking out snobby bloggers who have weird mushy noodle phobias. 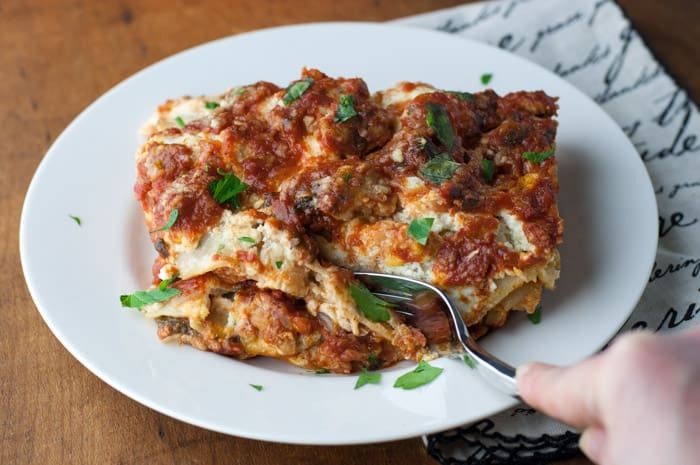 This lasagna does have ricotta in it. But, you guys, it’s soooo good. It’s got secret ingredients. They’re “classified.” But since you’re still reading, I’ll let you in on it and we’ll keep it on the DL. You and me. Pinky swearing, secret-keeping BFFs. This recipe is slightly adapted from Ina Garten, who shared this recipe with the world, so I’ve got my suspicions that more people know about this. But let’s pretend it’s just you and me, kay? In addition to boring ol’ ricotta, it’s got Pecorino Romano and goat cheese. Did you hear me? GOAT CHEESE. And if that wasn’t enough cheesy heaven for ya, we’re going to throw in some fresh mozzarella. Because 3 cheeses is never enough. You already knew that. And just so you’re not misled by the No Boil Lasagna name, you do still have to soak the noodles in some hot tap water for 20 minutes. I assumed I would be laying down dry, hard, lasagna noodles and the no-boil thing would save me a step. Nope. I’m not gonna lie. There’s still a step. But it’s okay. You’re okay. I’m okay. We’re all going to live happily ever after when we taste the punch of flavor dangling from our forks. In a large nonstick skillet, heat the olive oil over medium-low heat. Once the skillet is preheated, add the onion and lightly sprinkle the onions with salt. Cook for 5 minutes, or until translucent, stirring occasionally. Add the garlic and cook for one minute, stirring occasionally. Add the sausage and cook for 8-10 minutes. Stir occasionally and break up the sausage with a silicone spatula or spoon as you go. When the sausage is no longer pink, add the tomatoes, tomato paste, 2 tablespoons of the parsley, all the basil, red pepper flakes, fennel seeds, 1 1/2 teaspoons salt, and 1/2 teaspoon of pepper. Stir until combined and simmer, uncovered for 15-20 minutes over medium low heat, stirring occasionally. Meanwhile, preheat the oven to 400°. Fill a stock pot with very hot tap water. Add the noodles and allow them to soak in the water for 20 minutes. Drain when finished. 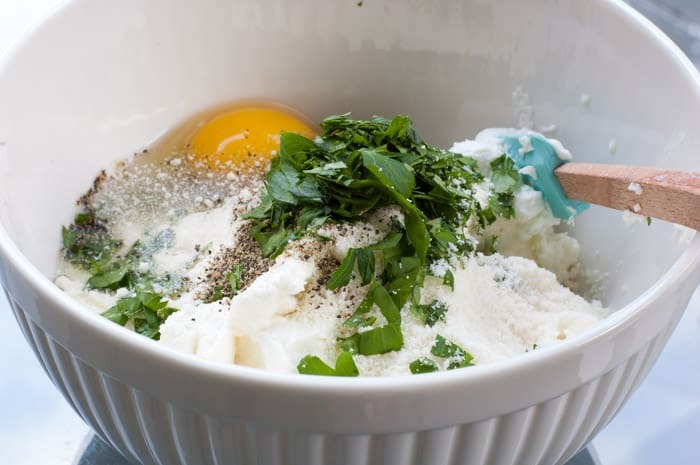 In the meantime, in a medium bowl, add ricotta, goat cheese, 1 cup Pecorino Romano, egg, 2 tablespoons chopped parsley, 1/4 teaspoons salt, and 1/4 teaspoon pepper. Stir until well combined. Set aside. Get ready to prepare your lasagna! Sprinkle top with 1/4 cup of Pecorino Romano cheese. Bake at 400° for 30 minutes. The sauce should be bubbling when you take it out of the oven. Let rest for 5-10 minutes before serving. Garnish with parsley, if desired. * If you have a specific cheese knife, great. But if you don’t, I found it was easier to thinly slice the mozzarella with a serrated knife. You can also try running the serrated knife under hot tap water, every few slices. 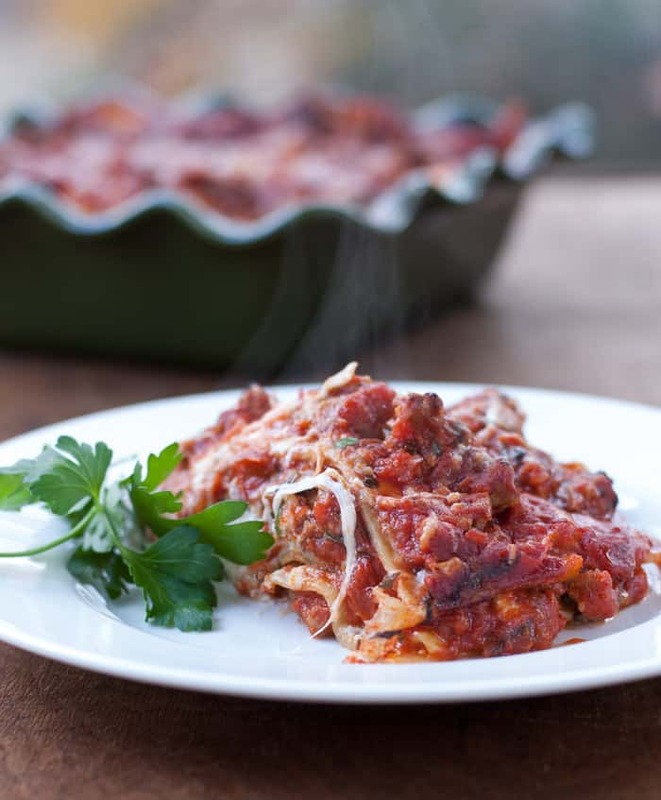 ** If you want a really deep lasagna, you can multiply this recipe by 1.5 and use a very deep baking dish (at least 3″ deep). I recommend Mario Batali’s Lasagna/Roaster. But you’ll need to adjust your layers (i.e. don’t use 1/3 of sauce to start out, maybe use 1/4 so you’ll have more layers in the end. The same goes for the noodles, mozzarella, and ricotta mixture). Yeah, most people just look at me like I’m an alien if I admit that. But this recipe has changed my mind. 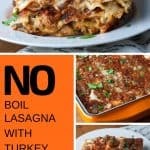 I might create some more lasagna recipes using this “no boil” trick! 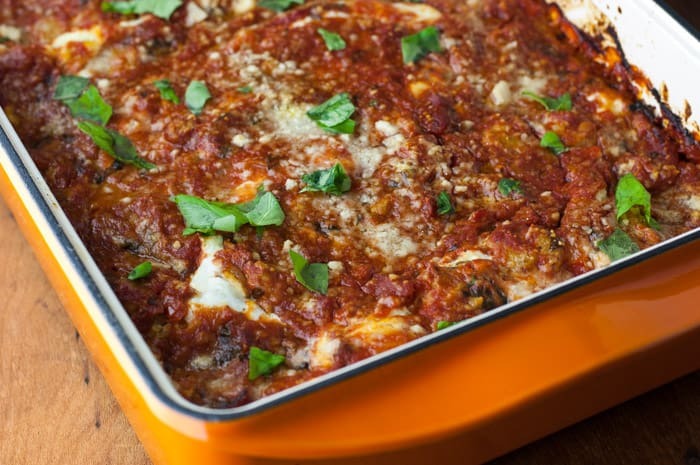 I love your new lasagna pan! This recipe sounds great and I will try it for sure! 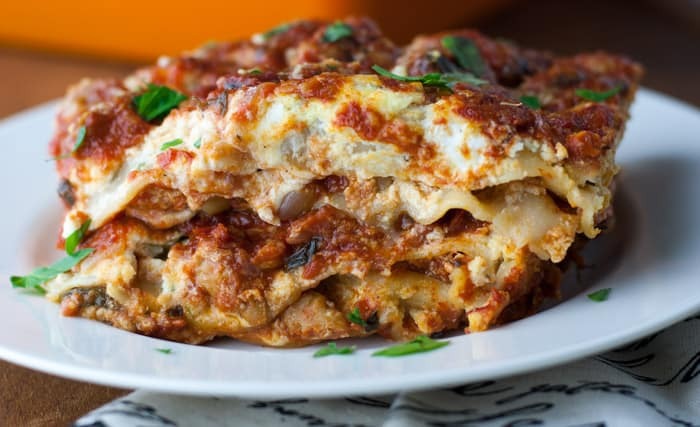 I am sure that your mom and mother-in-law are happy that you like their lasagna dishes! You must be an awesome daughter! I forgot to say that, as usual, your photographs are DELICIOUS!